View of broken boulder held together by metal band. 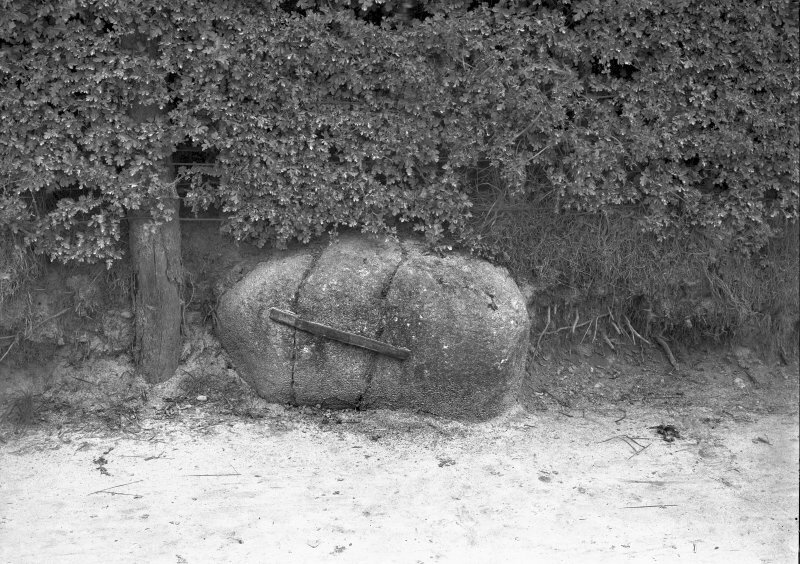 Original negative captioned: 'The Witche's [sic] Stone near Forres'. Only one granite stone, 3ft square and 1ft high, remains of three set to mark the graves of the three witches who bewitched King Duncan in 960. It is clasped by an iron band. A second stone is said to exist in the garden of nearby Trafalgar Place. The third stone was broken up in 1802, when the remaining stone was also damaged. H B Mackintosh 1928; J B Ritchie 1932. "WITCHES STONE. From Cluny Hill witches were rolled in stout barrels through which spikes were driven. Where the barrels stopped they were burned with their mangled contents. This stone marks the site of one such burning." At NJ 04345930, in the garden of 'Trafalgar Place' (a new bungalow) is a boulder of conglomerate 0.8m high with a maximum dimension of 1.1m also said to be one of the Witches Stones (Mr Woods, Trafalgar Place, Victoria Rd, Forres). It is in a part of the garden that was previously covered by dense vegetation and was moved about 1.0m to the West when the new property boundary was erected. Visited by OS (RDL), 18 September 1963.